The Captain finds a new way to come through in the clutch. To kick off 2019, we're unveiling our count of the Yankees' 19 best games since 2000. Historic feats, classic comebacks and postseason glory all find their way onto the list with an obvious No. 1 coming Jan. 20. Let's continue with No. 5, Derek Jeter's flip play against the Athletics. The Yankees followed up their 2000 World Series title with a 95-win season in 2001. They won the American League East by 13.5 games and were looking for their fourth straight World Series title and fifth in six years. The Athletics won 102 games that season, but the Mariners won a record 116 games and took the AL West. 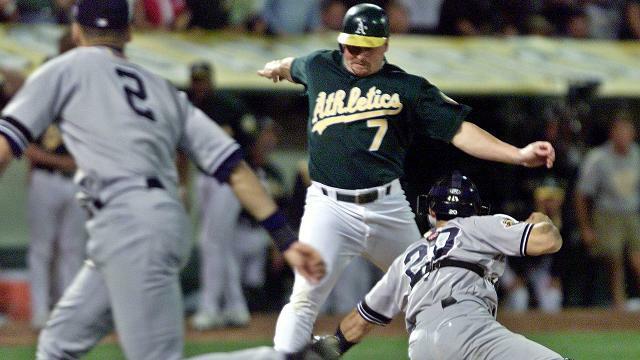 That set the Athletics up for a second consecutive ALDS matchup with the Yankees. Oakland took the first two games in the Bronx by scores of 5-3 and 2-0, respectively. For the first time in a few seasons, the Yankees were staring elimination from the postseason in the face..
That left the Yankees in a do-or-die Game 3 in Oakland to save the series and their season. Manager Joe Torre sent out the reliable Mike Mussina to oppose a 17-win Barry Zito. It was a pitchers' duel, with the only blemish coming in the top of the fifth inning. With the game scoreless, Jorge Posada homered to left field off Zito to put the Yankees ahead, 1-0. Shane Spencer followed with a double -- the Yankees' only other hit -- but was left on base. Mussina got Jermaine Dye and Eric Chavez out to open the seventh inning but allowed a single to Jeremy Giambi. Terrence Long came up next and had a chance to tie the game with an extra-base hit. He did just that as he singled past a diving Tino Martinez, and the ball rolled into the right field corner. Spencer was able to field the ball cleanly but overthrew both cut-off men; this allowed Derek Jeter to play hero. As the ball flew over the heads of Martinez and Alfonso Soriano, Jeter ran toward the first base line, collected the ball and dumped a shovel pass to Posada, who tagged out Giambi on the bottom half of his right leg. The play not only saved the game, but gave the Yankees momentum over the rest of the series. Mariano Rivera came in for a six-out save and delivered two scoreless innings. The Yankees won the game but still needed to win the next two to advance to a fourth straight ALCS. They then knocked off Oakland by scores of 9-2 and 5-3 to take the series and move on to a matchup with the Mariners. The Yankees beat that uber-talented Mariners squad in five games before falling to the D-backs in an epic seven-game World Series.